How concerned should I be about the health effects of runner's diarrhea? I am a relatively healthy woman in my early 50’s. 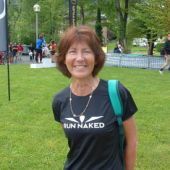 I have been long-distance running for about 30 years, and I still struggle with runner’s diarrhea. At this point, I don't really need any advice on how to prevent it. I've already studied it and tried everything. It only happens to me during the run (sometimes more than one time). I am fine after I finish my run. It’s like my whole system gets emptied out, and then I'm back to normal. I am very good about drinking lots of water and getting good food in my system after I get back from a run, and all throughout the day. Also, I never have terrible cramping or stomach pain during the run so I'm not miserable during it. I still really enjoy the run. I just suddenly have the urge to go and I have to find a hidden area immediately. (Usually no time to find a bathroom.) BTW, this doesn’t particularly bother me. My only concern is the health issues related to the diarrhea. Is this something that I should worry about or do the health benefits both physical and mental outweigh the negative of the diarrhea. Is this something I should be concerned about? I am wondering if I should give up running, which I love very much. I never have this problem with using an eliptical. But, I enjoy getting out of the house so my preference is running. I like to go first thing in the morning and want to get back to going every day. Would love to hear from anyone who has advice on this (a doctor’s response would be ideal). Hi, First off, I am not a doctor but I trained as a nurse. You are not alone having runner’s diarrhoea. In fact, most runners at some time have suffered and some are regular sufferers. 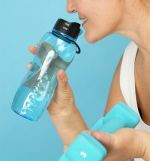 You are being very sensible in making sure that you rehydrate properly after your run but also make sure that you rehydrate during your run as well. Diarrhea causes not only a loss of fluids but also a loss of electrolytes. You might consider taking an electrolyte solution with you on your runs too. I know that you feel that you have exhausted all the possible solutions, but have you seen a sports or gastrointestinal specialist who may have some other ideas. To be honest, runner’s diarrhoea is not something that you should just accept as ‘normal’ and that you just have to put up with. The most common solutions can be as simple as changing your diet, your running intensity or your eating habits. But there could also be other issues such as irritable bowel syndrome or colitis which a doctor can diagnose. You sound as though you love your running which I totally get, so do go and see a doctor if you haven’t already (preferably a sports specialist or gastrointestinal specialist), as it would be such a shame to stop doing something that you love.